My mom used to make these napkin cards all of the time from various printed napkins, and they’re a fun alternative to traditional boxed Christmas cards. As stores start stocking up for Christmas, be on the lookout for designs you like. Whether you like modern, whimsical, traditional or abstract, there are plenty to choose from! The hardest part of this project is peeling the layers of your napkin apart (the cheaper 2-ply cards are better for your wallet and easier to use! ), but you could do that in the school pickup line or one evening while watching TV since it doesn’t require any other supplies! Cut your cardstock to size for your cards and carefully fold in half and crease. We cut our 8.5″ x 11″ cardstock in half and then folded each of those halves to make 5.5″ x 4.25″ cards. Open the card back up and lay it on an ironing board with the outside up. Unfold a napkin and peel the layers until you have just one thin layer with a design (most will have 2-4 layers). This part can be tricky, but try folding or tearing the corner to make it a little easier. Cut a piece of plastic wrap slightly larger than your card so that it hangs over the edges. Lay the decorative napkin layer on top, making sure the important parts of the design aren’t over the edges of the card. Take one of the blank layers from your napkin and lay it over the top of the other three layers. Set your iron to the wool setting with no steam and slowly iron over the card, holding the iron for 15-20 seconds in each section. Let cool completely and lift up the top layer (which is just used to protect the design while you iron). 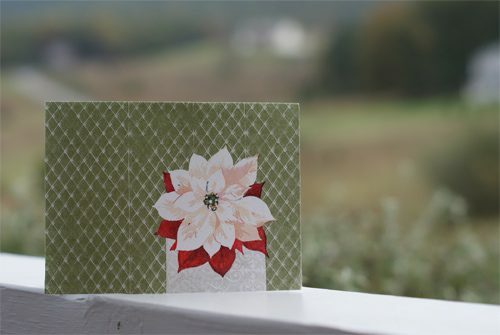 Trim the napkin and plastic wrap around the edges of the card, fold in half, and you’re done!